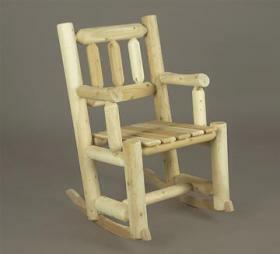 The carefully crafted curved rocking foot ensures a smooth ride while the traditional log style design make this the perfect porch rocker for wiling away the hours with a good book or knitting project. Solid cedar construction ensures years of carefree use. Cedar is also naturally resistant to decay, insect, and weather damage and, when left untreated, the creamy natural color weathers gracefully to a silvery grey.